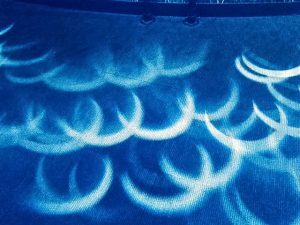 Tornado chasing may sound familiar but how about eclipse chasing? 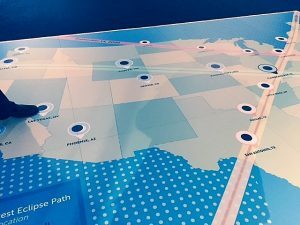 ‘Chasing Eclipses,’ a new exhibit at the Adler Planetarium, has a terrific “Eclipses Over America” floor map that includes the primary watching path for the total solar eclipse US residents will experience on Aug. 21, 2017. Visitors can see that the eclipse will be moving diagonally across the country from Salem, Oregon through Carbondale, IL to Charleston South Carolina. The map also shows the paths of other eclipses. The exhibit talks about eclipse chasers who would travel to the best spot, such as Carbondale, to experience the awesome change of light and air that happens during a solar eclipse. The Adler will have an event in Carbondale where astronomers and eclipse chasers will comverge. Total coverage could last about 2 minutes and 42 seconds. Carbondale area hotel spaces are already going quickly. For Carbondale tickets and information visit Eclipse SIU. Ciupik noted that the moon would begin blocking the sun from Chicago about 11:54 a.m. and reach maximum coverage about 1:30 p.m. and that it would be over by 2:30 p.m. He expected thousands of people to join the Adler’s watching party. Proper glasses will be handed out until the supply is gone. But the exhibit is worth seeing ahead of time. Visitors learn how much of the moon will block out the sun if watching from further away than at dead-centered totality. At the exhibit look down for multiple eclipse shadows on the floor. 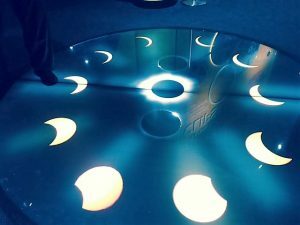 They reflect what people will see on the ground if they are outside while the moon moves across the sun. Remember, people are standing in the shadow of the moon. Find out at the exhibit how much of the sun will peek out around the moon in different cities that are on the eclipse map. Even though Carbondale will experience a total blackout that includes the sun’s atmosphere, the experience will feel somewhat similar in such towns as Chicago and Minneapolis. If you think you will be visiting another city that day, check the map at the exhibit for an idea of how much blackout you will experience. Look for slivers of white around part of the black circles near different cities. Even a glimmer of sun light will be too bright to safely observe the eclipse without a filter. A craft room that will be turned over to the eclipse exhibit will have instructions and some materials on what to make for a safe viewing device. The only safe time to observe the eclipse without a filter is when and where the moon blocks out all sunlight. Adler astronomers warn not to look directly at the eclipse without special glasses or use of a viewing device. 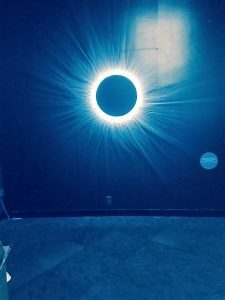 The exhibit also features an eclipse simulation experience that includes sound and air because even in hot August, when the moon shuts out the sun the air will feel cooler and birds stop singing. Other things to look for on the large floor map are the paths of other eclipses. The next one in the US will be 2024 but Chicago won’t see another total solar eclipse until 2099. Check out NASA for more eclipse information. For Chasing Eclipses at the Adler Planetarium go to Adler. Details: The exhibit goes from March 25, 2017 through Jan. 8, 2018. The Adler is at 1300 South Lake Shore Drive Chicago, IL 60605. For ticket and other information visit Adler Planetarium (312) 922-7827.